This program is owned by Oracle Service Contracts. It generates a log file of the total value processed, total value successful, and total value rejected for billing. 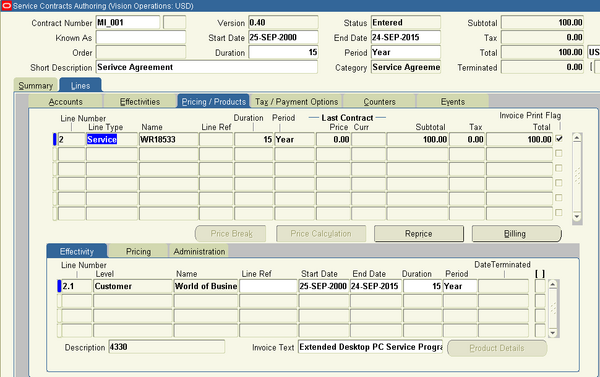 For usage lines, the Service Contracts Main Billing program calculates billing amounts based upon the usage type. A billing schedule determines when the customer is billed for the services they receive. 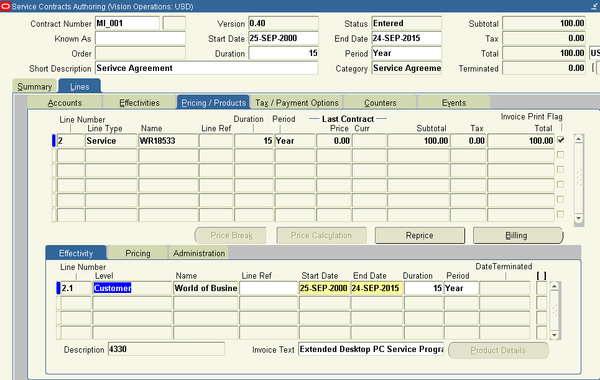 You must specify billing schedules for each contract that you author in Oracle Service Contracts can be indirectly created from Oracle Order Management. You do not need to create billing schedules for such contracts. 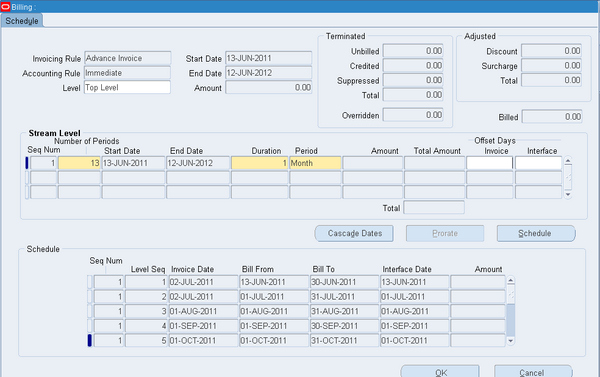 Billing schedules can be defined at the contract header, the contract line, or the subline level. 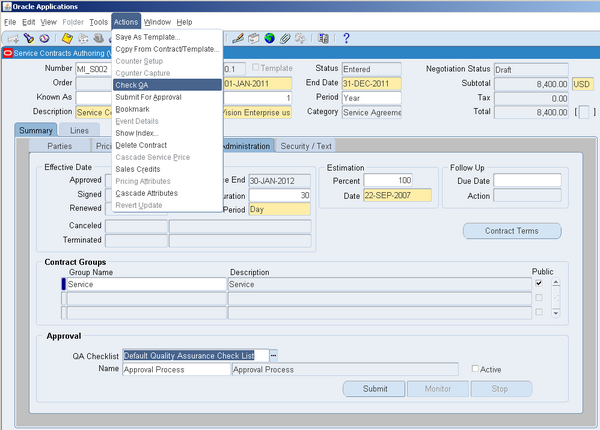 Oracle Service Contracts leverages Oracle Workflow to automate the contract approval process. The Submit for Approval function starts the quality assurance (QA) check. If the QA check is successful you can continue the approval process, which submits the contract to the approval workflow. The QA Check is an automated process that verifies the validity of a contract. A default QA checklist is seeded in the application. However, if required, the default QA checklist can be modified to include other checks. The default is set with the profile option OKS: Default QA Checklist. 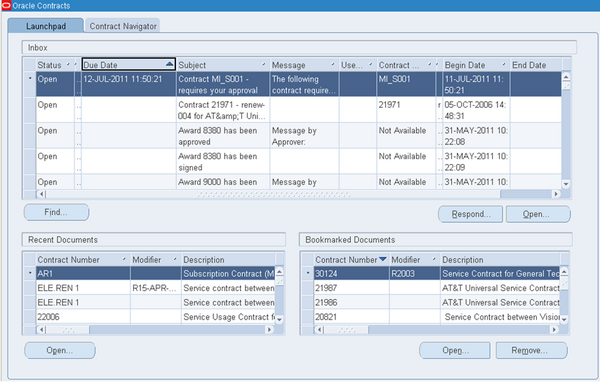 You can override the default checklist from the Summary Administration tab of the Service Contracts Authoring form. Most of the information for a service line comes from the defaults that you enter in the Summary tab or by the application itself from the coverage template that is associated with the service. 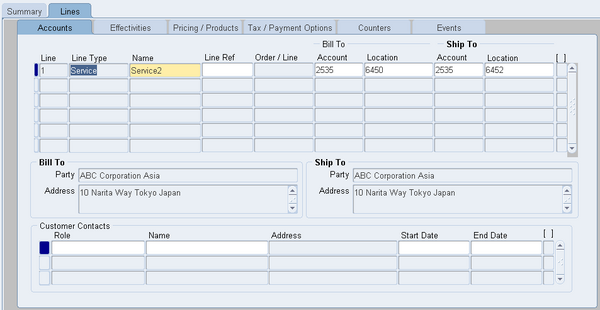 But you can manually modify the service line information as per the business requirement. • For a service contract of category Service Agreement or Subscription Agreement, select Service. • For a service contract of category Warranty and Extended Warranty, select Extended Warranty. A service can cover broad-category business processes such as field service, depot repair, call center, technical support, safety inspections, and any other user-defined business activities. Each service is set up by the application administrator as an item in Oracle Inventory and is associated with a coverage template. The coverage template specifies the business processes that are covered, the times that the customer is entitled to the coverage, amounts that are covered and applicable discounts, as well as any resources that are to be used and their pricing. 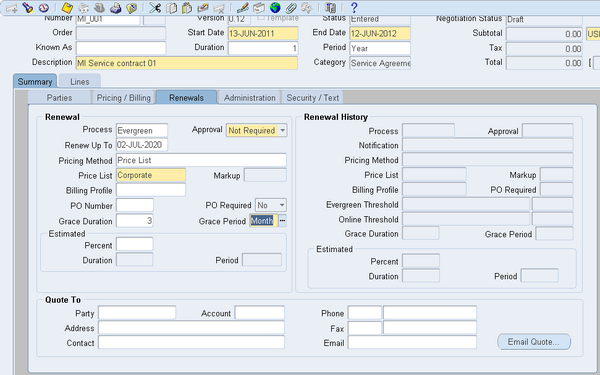 Your application administrator can set up automatic default values for contract renewals. If such defaults exist, then you may not be required to enter renewal information. Check with your application administrator. To renew the contract, you must also specify how to renew each line. For contracts with service lines you can bill the customer either at the line level or the subline level, but for contracts with usage lines you can bill only at line level. If your organization has a Pricing Agreement set up with the party you are billing, then use the Agreement LOV to enter it. This automatically passes all of the other required fields including the price list, the accounting rule, the payment terms, and the invoicing rule. Pricing Agreements, which specify prices, discounts, and billing practices for a particular customer, are created in Oracle Order Management. what is your question ?? ?